Ms Sharif said she intended to unite the students during her term as head girl. Mr Niazi dedicates the achievement to his late father. 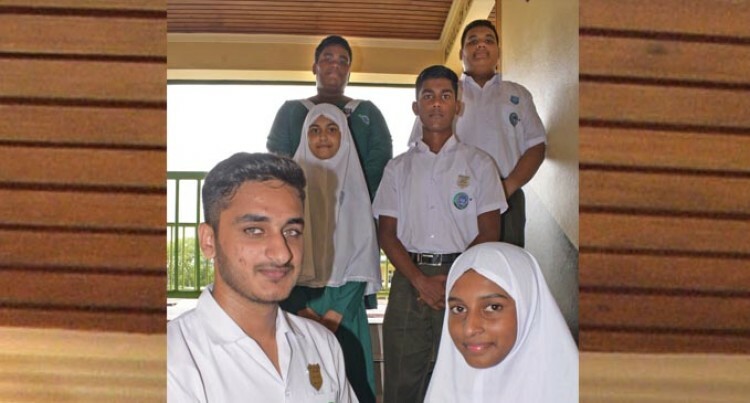 Naeema Sharif and Haider Khan Niazi thanked the teachers of Nasinu Muslim College for their support and encouragement as they take on their new roles as head boy and head girl. A total of 156 prefects, class captains, school heads and deputies were inducted at the school yesterday. Ms Sharif, 18, of Nadawa in Nasinu, said she intended to unite the students during her stay as the school’s head girl. “It is my belief that the school experience would be better if our students unite and really make the most of each other because we all have different strengths and talents,” she said. The aspiring doctor scored 370/400 in the Fiji Year 12 Examination last year and has her eyes on the Dux Award. “My parents were so happy when they found out I was selected as head girl,” she said. Mr Niazi, 19, who is originally from Pakistan dedicated the achievement to his father who passed away last year. His family moved to Fiji in 2015 and Mr Niazi said the transition into the culture and education system had been effortless, much to his surprise. “Fiji is beautiful, the people are friendly and so the transition was not difficult,” Haider said. The 19-year-old aspires to become a software engineer. “Computing is my passion, I love to code and that’s what I intend to pursue,” he said. In his role as head boy he hopes to empower students and bring about positive change where necessary.